On the famous Yangtze River of 6,380 kilometers long, there are many ports in many cities, including Chongqing, Yichang, Wuhan, Shanghai, Nanjing, and so on, serving for the passenger ships and cargo ships. Among all, Chongqing Port (Chaotianmen Port) and Yichang Ports (including New Century Port, Taohuacun Port and Maoping Port) are comparatively more frequently used for the upstream and downstream Yangtze River cruise between Chongqing and Yichang cities. To help you have a clearer understanding of the main ports and better plan your upcoming Yangtze River cruise trip in China, we have listed the main departure ports in those two cities, with the briefing, location, transportation, recommended places to visit at below. Please check for the details. Chongqing Chaotianmen Port (重庆朝天门码头), as the start point of a downstream Yangtze River cruise and the terminal point of an upstream cruise, is the largest port in this city and has long been contributing to the prosperity of Chongqing city. Situated at the junction of the Yangtze River and the Jialing River, Chaotianmen Port enjoys the best location for Yangtze River cruise. This main port consists of 13 separate small docks, and nearly all the Yangtze River cruise ships dock here for the serving of Yangtze River travellers, with different ships at different docks. (Our port map will show you the location of each pier). However, since the specific dock number of your ship from Chongqing is published only 1 to 2 days before the departure date, according to the official regulations on the port administration, we will inform you the published dock number once we receive it. So you don’t have to worry and just keep in touch with our Travel Consultant before embarkation. How to Go to Chongqing Chaotianmen Port? As Chaotianmen Port is at the city downtown of Chongqing, only about 4 kilometers to the very center of the city, travellers can get there by several kinds of transportation, like the public buses, railways, taxies, etc., from the main transportation places and other areas in this city. See the detail distances, means of transportation and time needed from the airport and railway stations. Note: the information mentioned above is only for your reference, and detail distances and time are varied according to the practical situation. For Yangtze River downstream cruise from Chongqing to Yichang, the embarkation time begins at around 18:00 in the late afternoon and the ship usually depart from Chongqing at 21:00 at that night. To ensure you embark the ship on time, we suggest you book a flight arriving at Chongqing before 17:00 and a train arriving before 18:00. For Yangtze River upstream cruise from Yichang to Chonqging, the guests will disembark the ship at around 08:00 in the morning, and it is better to book your flight taking off from Chongqing after 12:30 and train departing after 11:00. If you arrive in Chongqing early, before your embarkation onboard your cruise ship, you can spend some great time exploring the local culture, gourmets in this city, such as the hot pot, and attractions like Ciqikou Ancient Town, Dazu Rock Town, Eling Park, Hongya Cave, etc. Ciqikou Ancient Town, only about 17km from Chaotianmen Port and needs around 35 minutes by taxi. Known as the “Little Chongqing”, it is the miniature and symbol of old Chongqing. Take a leisure stroll along the jubilant, antique and charming ancient town, savor the multiple cultures, and enjoy the traditional performances and snacks. Dazu Rock Carvings, listed as the “World Cultural Heritage Site” and one of the “World 8 Great Grottoes”. It shows the excellent cliff inscriptions in the 7th century A.D. in ancient China. It is precious and rare in the world with the large scale, colorful cultures, outstanding artistic skills, and well preservation. About 105km away from Chongqing, it takes about 2 hours and 15 minutes by taxi. Check all interesting Chongqing attractions and activities. 2019 Port Change News for Yangtze River Cruises: In 2019, Yichang New Century Port is stopped using. All Yangtze River cruise ships would use Yichang Maoping Port for embarkation and disembarkation in Yichang (except Yangtze 1 still using Taohuacun Port). For downstream cruises, after visiting the Three Gorges Dam site, the cruise companies will arrange buses to transfer visitors from the site to Yichang Three Gorges Center Cruise Terminal for departure (about 1-1.5 hours’ driving). For upstream cruises, visitors need to gather at Yichang East Railway Station or Yichang Three Gorges Center Cruise Terminal to take the arranged bus to Maoping Port for boarding (about 1-1.5 hours’ driving). If you have any questions, please ask our travel consultant for help. Yichang city has altogether 6 ports, among which Maoping Port (茅坪码头) and Taohuacun Port (桃花村码头) are the most important ports for your Yangtze River cruise. Maoping Port is a little far away from the city downtown (See the Yichang Port map), while Taohuacun Port is comparatively closer. 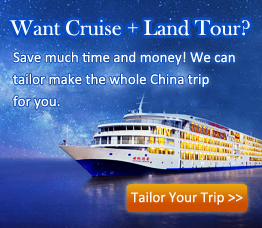 See each port for different cruise companies on Yangtze River. How to Go to / Away from Yichang Maoping Port? Maoping Port in Zigui County is about 55-60 kilometers away from Yichang downtown, and it needs about 70-90mins’ driving. It is about 75-85km’s driving distance for 90-120mins from Yichang Sanxia Airport, 65-80km for 85-95mins from Yichang East Railway Station, and 55-60km for 70-85mins from Yichang Railway Station. For travellers of Maoping Port docking cruises, they are required to gather first at Yichang Three Gorges Center Cruise Terminal (宜昌三峡游客中心) (or called Yichang No.9 Dock (宜昌九码头) in Yichang downtown or Yichang East Railway Station during about 16:00-21:00 and the cruise company will arrange buses to transfer Yangtze River cruise travellers from the gathering place to Maoping for upstream embarkation. And for downstream disembarkation, the arranged buses will take travellers from Three Gorges Dam site to Yichang Three Gorges Center Cruise Terminal, and then, travellers can go to the airport, railway stations or other places with easy local vehicles. Therefore, people taking Yangtze River cruise ships docking at Maoping Port don’t have to worry about the transportation. Around 16:00-21:00 Yichang Three Gorges Center Cruise Terminal (宜昌三峡游客中心) or Yichang East Railway Station (宜昌东站) Get on the arranged bus to shuttle to Maoping Port for cruise embarkation. 2. Walk about 300 meters through the square in front of the railway station to the “Luxury Cruise Shuttle Boarding Point” (豪华游轮转运乘车处), and then take the shuttle bus with your bus ticket. (you could take your own luggage to get on the same one bus. Besides, you could enjoy the luggage service and the cruise staff would transfer it from the gathering places to the reception desk onboard your cruise, which needs extra and reasonable payment. 1. The information mentioned above is only for your reference, and detail distances and time are varied according to the practical situation. 2. Address of Yichang Three Gorges Center Cruise Terminal (or called Yichang No. 9 Dock): No.142, Yanjiang Avenue, Wujiagang District, Yichang City (facing Yichang Wanda Plaza) 宜昌市伍家岗区沿江大道142号 - 宜昌三峡游客中心 (宜昌九码头). 3. Address of Yichang East Railway Station: Chengdong Avenue, Wujiagang District, Yichang City 湖北省宜昌市伍家岗区城东大道 - 宜昌东站. 4. Yichang gathering place choosing: if you are arriving in Yichang by train, we suggest you gather directly at the Yichang East Railway Station, where you could easily find the arranged bus after exiting; if you arrive by plane, you could choose to gather at Yichang Three Gorges Center Cruise Terminal. How to Go to / Away from Yichang Taohuacun Port? Taohuacun Port is about 10.5 kilometers from Yichang downtown. There are not many public buses to Taohuacun Port, however, with the convenient taxi, it is also easy to get to and away from Taohuacun Port. Check the distances and traffic time of each port between the city center, airport, and railway stations at below. For Yangtze River upstream cruise from Yichang to Chonqging, the gathering time for Maoping docking cruises starts around 16:00 in the afternoon, and it is advised to take a flight arriving in Yichang before 15:00 or a train before 15:30. For Yangtze River downstream cruise from Chongqing to Yichang, travellers usually arrive in Yichang city after 12:30-13:30, so it is suggested booking a flight taking off after 16:00 or a train departing after 15:30. Yichang city in Hubei province provides a series of interesting attractions to visit, such as the Three Gorges Dam Site, Gezhouba Dam, Yichang Museum, National Sturgeon Museum, Sanyou Cave, etc. The Three Gorges Dam, the largest hydropower system worldwide with the total length of 2,308m and the height of 185m. This world class project has contributed a lot to the flood control, navigation efficiency, electric power generation, tourism, etc. All cruise ships select it as an arranged shore excursion site. Gezhouba Dam, or Gezhouba Hydropower Station, only 5 kilometers from Yichang downtown is the first large hydropower station in China. This project has solved many problems like, the electricity shortage in central and eastern China, dangerous shoals, floods, etc. Moreover, it has laid a solid foundation for the construction of the Three Gorges Dam. Check all interesting attractions and activities in Yichang. If you want to know more information about departure ports in Chongqing and Yichang, please feel free to contact our professional Travel Consultant for help.